Skipper & Kwon's Risk Management & Insurance: Perspectives in a Global Economy provides an in-depth understanding of international risk management and insurance, their dynamics, and the economic, social, political, and regulatory environments surrounding global risk and insurance markets. Harold D. Skipper is former Chairman of the Department of Risk Management and Insurance at Georgia State University where he held the C.V. Starr Chair of International Insurance. He is past President of the American Risk and Insurance Association and Associate Editor of Risk Management & Insurance Review and Geneva Papers on Risk and Insurance. He has authored and edited numerous books, including Life & Health Insurance, 13e (with Kenneth Black, 2000) and International Risk & Insurance: An Environmental-Managerial Approach (1998). W. Jean Kwon is Associate Professor of Insurance at the School of Risk Management, St. John’s University. He gained his experience from working in academia, the insurance industry and the government in the U.S. and abroad. He is past President of the Asia-Pacific Risk and Insurance Association and serves the Organization Committee of the World Risk and Insurance Economics Congress. He has authored several books, including Risk Management and Insurance in a Singapore Context (2000), and is on the editorial and advisory boards of several insurance journals and insurance institutions worldwide. 1. 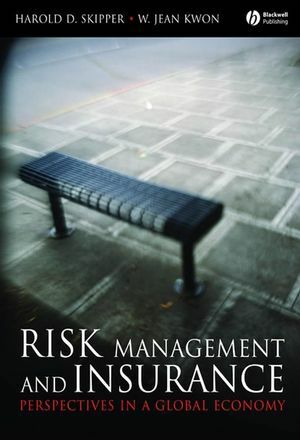 Introduction to Risk Management and Insurance. The Importance of an International Perspective. Risk Management and Economic Growth. The Language of Risk and Insurance Internationally. The Environment for Risk and Insurance Internationally. The Structure of this Book. 2. Risk Perceptions and Reactions. 3. The Economics of International Trade. The Economic Theory of Trade. International Trade in Insurance: Economics and Policy. Part II: Factors Shaping the Risk Environment Internationally. 4. Societal Risk Assessment and Control: Theory and Practice. The Role of Government in Societal Risk Management. Alternative Approaches to Societal Risk Management. Understanding Societal Risk Perceptions and Decision-Making. Conclusion: The Ultimate Risk Bearer. 5. Catastrophe Risk Assessment: Natural Hazards. Catastrophic Events: Definition and Trends. 6. Catastrophe Risk Assessment: Human Factors. The Role of the Precautionary Principle. 7. Societal Risk Management and Changing Demographics. Economic Growth and Labor Market Challenges. The Challenges to Financial Markets. Implications for International Relations and Stability. 8. Regulation of Private-Sector Financial Services. Government’s Role in Regulating Private-Sector Financial Services. Overview of Financial Services Regulation. Governmental Actions Affecting Financial Services Regulation. Why Private Markets Fail to Provide Some Financial Services. Selected Public-Based Economic Security Services. The Future of Social Insurance. Major Legal Systems of the World. International Variations in Contract Law. Choice of Law and Free Trade. 11. Sociocultural Effects on Risk Management. The Intersection of Culture and Risk Management. Culture and Informal Risk Management Arrangements. Risk Perception Theories and Formal Insurance. Part III: Enterprise Risk Management in a Global Economy. The Evolution of Enterprise Risk Management. 13. Internal Loss Financing Arrangements. Motivations for Internal Loss Financing. 14. External Loss Financing Arrangements. Appendix 14A: Proof of Currency Relations. Appendix 14B: Pricing Currency Options. 15. Risk Management for Catastrophes. Risk Management for International Employees. Modes of Foreign Market Entry. Financing the Political Risk Exposure PM. Political Considerations in Emerging Markets. 18. Intellectual Property and Technology Risk Management. Biotechnology Risk: The Human Genome Project. Part IV: Insurance in a Global Economy. 19. The Economic Foundations of Insurance. Expected Utility and the Demand for Insurance. Insurance Supply: Characteristics of Ideal Insurable Exposures. 20. The Nature and Importance of Insurance. The International Dimensions of Insurance Supply. The Role of Insurance in Economic Growth. Determinants of Insurance Market Structure. Policies Sold by Life Insurance Companies. Selected Life Insurance Markets Internationally. Policies Sold by Nonlife Insurance Companies. Selected Nonlife Insurance Markets Internationally. 24. Regulation and Taxation in Insurance Markets. Meanings and Forms of Integration. Public Policy Concerns in Integration. The Future of Financial Services Integration. 26. Risk Management and Insurance in a Global Economy: A Future Perspective. Environments of the Future24 PM. Risk Management in a Future Global Setting. Insurance in a Future Global Setting. Glossary of Key Terms and Acronyms. "'Balanced' is a good word for describing this text. In addition to striking a nice balance between accessibility and thoroughness, it also maintains good balances between breadth and depth, and between the areas of risk management and insurance. I found the writing clear and the within-chapter organization of topics very logical. The text would be useful to both MBA students and insurance industry professionals."